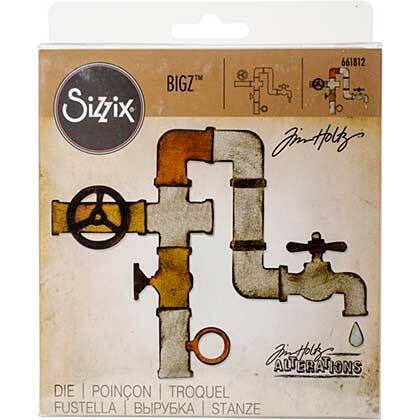 SIZZIX-Bigz Die by Tim Holtz Alterations. A Bigz die cleanly cuts thick materials including cardstock, chipboard, fabric, foam, magnets, leather, metallic foils, paper, and much more! Its wider size offers you more design options. Die measures 5.5x6x.625 inches. For use with the BIGKick, Big Shot and Vagabond machines (not included). Design: Pipeline. Designer: Tim Holtz.